I don't know what the heck has been going on recently, but my skin has seen better days. Aside from the regular signs of aging, my pores have gotten huge and my skin just looks TIRED. Naturally, this does not please me, so I turned to the internet and my favorite beauty bloggers Dena, Sascha and Megan for their advice on the best face mask to help me out. The ladies gave me tons of great options to try! After doing some research and testing out a few products, I have found one that I love. Sidenote: That's the thing about beauty products right- there's never just one mask, one lipstick, one concealer etc. You just have to try things out and find what works best for you, for whatever issue/thing you are trying to address. A good recommendation always helps though! 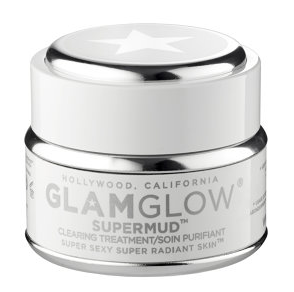 So the face mask I am in love with is the GLAMGLOW SUPERMUD Treatment Mask. I chose this mask because all my research said how effective it was and how it left your skin glowing. I watched a lot of trial videos and I felt like all of the ladies trying the product felt the same way. GOD I LOVE THE INTERNET. Anyways, the way the mask works is that, while it dries, you can see it cleaning out your pores- literally little dots show up all over the mask. It's totally gross and awesome at the same time! Once you remove the mask, your skin really is SO soft and clear looking. Even better, when I woke up the next morning, my skin looked so divine, I wondered if I actually even needed to wear makeup. Usually when that happens, after I put makeup on, I think "oh God what was I thinking before." This time though, I was happily surprised that that was not the case. 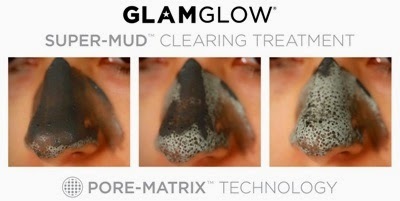 The GLAMGLOW SUPERMUD Treatment Mask totally worked and I can't wait to keep using it! A definite recommend for anyone looking to clean up their skin.